I wish I could recycle all the time I spend throwing out junk mail. If there were a conspiracy to befuddle the masses, junk mail would be one of the most insidious weapons in the arsenal. Target the population with stealth junk covered with words like "important", "last chance! ", and "personal", preoccupy people's minds with semi-appealing offers, encased in envelopes whose recyclability is perpetually in question. If the conspiracy is successful, people will become deadened to all that claims to be important, personal or opportune. As our minds turn to jello, the nation will falter as it fails to respond to real crises and opportunities. So I offer this tidbit as a public service, in defense of our great nation and its precious reserves of grey matter. Will the windows contaminate the paper recycling process? A NJ Dept. of Environmental Protection staffer who lives the business of recycling day in and day out tells me the plastic windows float to the surface in the vat of recycled paper fibers and can easily be skimmed off. So toss those peskily windowed envelopes straight into the recycling bin, and save your quandaring for greater things. Another example of inadequate recycling in Princeton can be found downtown, in the borough. The library, for instance, recycles cardboard, but from what I've heard and seen, all paper, bottles and cans get tossed out with the trash. The library cafe has stylish but totally dysfunctional lookalike recycling and trash containers that both end up filled with trash. The two businesses I checked with are recycling bottles and cans, but all the paper and cardboard are getting thrown away. Email inquiries to the library and the Borough Merchants Association have not as yet gotten responses. Again, this is a situation where local government, which gets annual grants from the state to support recycling initiatives and recycling coordinator positions, could be stepping in to make sure businesses are complying with the mandatory recycling ordinances. The merchants association, borough staff and the business owners themselves all could be playing a role in solving any logistical hurdles. The value of recyclables when compared to landfilling costs, the introduction of single stream recycling in which bottles/cans and paper can be mixed together, and the potential for businesses to team up and share dumpsters--all are ways that costs could be minimized. What is most remarkable about the situation is that the great majority of Princeton institutions and businesses would surely say they are highly sympathetic to environmental concerns, and yet there is a breakdown in the expression of that sympathy at a nuts and bolts, day to day level. An inquiry to the Princeton University athletic department about the general lack of recycling at football games may prove to have been productive. Turns out they are updating recycling one stadium at a time. Well designed containers are in place at the new soccer stadium, with hockey and football to follow. They have instructed their university student teams (more sustainable than my suggestion of community volunteer groups) to separate out recyclables when cleaning the football stadium, so the 2000 or so plastic bottles strewn about after games may not end up in the trash. It's amazing how many poorly designed recycling containers are out there to be bought at great expense. The containers--stainless steel, $1000 a pop--are oftentimes chosen by the architects, who think about appearance rather than function. For an integrated decor, they choose recycling containers that look just like those for trash. Lacking visual cues, users don't stop to read subtle labeling, and so the recycling containers end up full of trash. The architects and the container manufacturers, through ignorance or indifference, sabotage the very activity they are supposed to be facilitating, and no feedback loop appears to be in place to change this. One of the most obvious breakdowns in recycling in Princeton is at sports events and festivals. I did a quick calculation after the stands were vacated at the Princeton University football game yesterday, and came up with a figure of 2000 plastic bottles laying around, all of which are probably being treated as trash by the custodial staff. One way to spare all these bottles from the trash would be to have the sports department give free tickets and some plastic bags to a scout troop, which would then gather and recycle all the bottles after the game, during the "fifth quarter" activities. The announcer could recognize the scouts over the P.A. system. The recycling receptacles at the stadium are few and far between, and look just like the trash receptacles except they have a slightly lighter shade of metal top. The holes on the trash and recycling receptacles are the same size and width--maybe a foot across, which means that the receptacle, though it says "bottles and cans" on it, is talkin' trash, so to speak. I checked two of them. One had mostly trash, the other, amazingly, had mostly bottles. Venders would be able to provide better numbers on overall bottle sales, but my guess is that about 5% of, say, 4000 bottles are getting recycled during football games. Recycling at the high school games is hit or miss. Sometimes there are receptacles, sometimes not. And, again, the recycling containers have wide tops that encourage people to treat them as trash containers. The trash cans, it turns out, make excellent squirrel traps. Their heavy lids are the kind with hinged doors you push on to put trash in. The resident squirrels apparently know how to get in through the hinged door, but can't get out. Twice in two weeks, now, I've had to pull the lid off, then stand back as the squirrel rockets three feet straight up in the air before zipping off into the bleachers. It's like watching a cartoon. 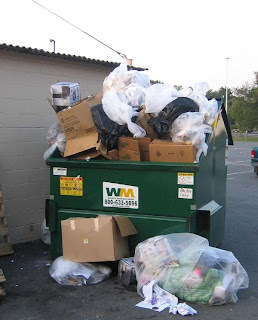 I recently inquired about how recycling is going at the Princeton Shopping Center. The Center contributes greatly to quality of life in Princeton, providing a convenient place to shop, whose proximity to residential neighborhoods becomes ever more important as we try to limit our individual carbon footprints. Businesses are required by law to recycle cardboard, which is becoming an increasingly valuable commodity. It's the township's responsibility to enforce this law and, if necessary, hand out fines for violations. However, during frequent shopping visits, I've noticed that cardboard is routinely getting thrown in trash dumpsters. Turns out that the shopping center provides a cavernous dumpster for cardboard, but it's located at the far northern end of the parking lot, which means that any worker given the task of dealing with boxes has the choice of walking a quarter mile to the recycling dumpster, or throwing it in the trash dumpster just a few steps from the back door. It's not surprising, then, that recyclables are ending up in the trash. Many businesses there no doubt recycle as they are supposed to, despite the inconvenient setup. McCaffery's compacts and recycles its own cardboard, and is also looking into partnering with a Pennsylvania company to have their food waste trucked away and composted. According to Jim McCaffery, the plastic bags customers return to the store are picked up by the Good Will and turned into things like benches.